Hewlett-Packard Company headquarters, Palo Alto, California. Some of America's greatest cultural heroes are its basement inventors and self-made business owners. These people prove the claim that a good idea and hard work can lead to success. David Packard (1912-1996) and William "Bill" Hewlett (1913-2001) made their first product in a small garage. From there, they went on to build the world's second-largest computer manufacturing company. For decades, Hewlett-Packard (HP) was also known for its loose management style, called "the HP Way." Packard and Hewlett never put themselves above their employees and gave them the freedom to try new ideas. In return, HP workers responded with commitment and loyalty. Those bonds, however, were tested in 2001, after Hewlett-Packard announced its merger with rival computer maker Compaq. William Hewlett and David Packard met in 1930 as freshmen at Stanford University, in Palo Alto, California. They shared an interest in the outdoors and electrical engineering. By their senior year, they were planning to form a radio company, an idea encouraged by Fred Terman, one of their professors. The business venture, however, was delayed for several years, as Hewlett earned a master's degree and Packard worked for General Electric, Inc. (GE; see entry) in New York. Finally, in the fall of 1938, Packard returned to California for graduate studies at Stanford, and he and Hewlett went to work. Their first workshop was a one-car garage behind the two-family house they shared in Palo Alto. Their assets included a used drill press and a little more than $500. They made several electronic products, including an automatic toilet-bowl flusher for public restrooms. Writing in American Heritage, historian Frederick E. Allen quoted Hewlett as saying, "In the beginning, we did anything to bring in a nickel." By November, the partners had built an audio oscillator, a device that creates high-frequency sounds. Their oscillator was cheaper and better than others on the market. They called their product the Model 200A, because, as Packard explains in his 1995 book, The HP Way, "We thought the name would make us look like we'd been around for a while." The partner's first major order came from the Walt Disney Company (see entry), which bought eight of the oscillators for $71.50 apiece. Since they were truly in business, Hewlett and Packard flipped a coin to see whose last name would go first in their new company's name. Subsidiaries: BT&D Technologies Ltd.; CoCreate Software GmbH; HP Computadores; Heartstream, Inc.; Microsensor Technology, Inc.; Technologies et Participations S.A.
Major Competitors: International Business Machines (IBM); Dell Computer Corporation; Sun Microsystems, Inc.; Hitachi, Ltd.; Apple Computer, Inc.; Gateway, Inc.; Ingram Micro, Inc.
After the United States entered World War II (1939-45) in 1941, HP's business grew. Hewlett served in the army, so Packard ran the company, which began building a variety of electronic measuring and testing equipment for the U.S. government. By the end of the war, HP's annual sales reached $1 million, and the company had a new manufacturing plant and more than two hundred workers. HP introduced profit-sharing and a health insurance plan—benefits largely unheard of at the time. In profit-sharing each worker is given a bonus based on a company's sales. A post-war downturn forced HP to fire some plant workers, but it hired more engineers, and in 1947 it formed a legal corporation. Within several years, the company was back up to two hundred employees and making a wide range of testing devices. By the end of the 1950s, HP had more than 350 products and was expanding into Europe. David Packard and William Hewlett form Hewlett-Packard (HP) to sell the audio oscillator they invented. HP sells stock and drafts the company goals that form the heart of "The HP Way." 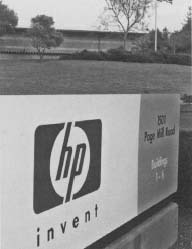 1966: HP Laboratories opens. An electronic desktop calculator is introduced. The first HP pocket calculator appears. HP introduces two new computer printers, the LaserJet and the DeskJet. HP sells a palmtop personal computer that weighs less than one pound. HP forms Agilent to develop and sell its testing and measuring. The purchase of Compaq Computer Corporation makes HP the second-largest computer manufacturer in the world. The "HP Way" was also firmly in place. Hewlett and Packard believed in "management by walking around"—they spent much of their time talking to the engineers and other employees instead of tying themselves to a desk. At a 1957 management meeting, the company came up with six goals, later expanded to seven. As Packard wrote in The HP Way, the goals included giving employees "the opportunity to share in the company's success" and "striv[ing] for continual improvement in the quality, usefulness, and value of the products and services we offer customers." That same year, 1957, Hewlett-Packard sold its first shares to the public. This means that shares, or small portions, of the company were available for sale on the New York Stock Exchange. The company also opened the first of six new buildings near Stanford University. In 1958, HP recorded sales of $30 million and had more than seventeen hundred workers. During the 1960s, Hewlett-Packard grew by purchasing several smaller electronics firms and expanding beyond measurement and testing devices. HP introduced its first computer, the Model 2116, in 1966. It also did important work on light-emitting diodes (LED's), the small electronic lights now common on computers and other products. The company's most significant new item, however, was the world's first programmable scientific desktop calculator. Prior to this, calculators were noisy, mechanical machines that used gears. The HP Model 9100 was electronic, more like a computer than a calculator. After the success of the 9100, Hewlett challenged his employees to build a calculator small enough to fit into a shirt pocket. The HP staff responded with the HP 35, which was an immediate hit with scientists and engineers. HP was the pioneer in powerful, handheld calculators, and it remained strong in the testing and measurement market. By 1980, annual sales were $3 billion, and the company had fifty-seven thousand employees. In 1989, the garage where David Packard and William Hewlett began their business was named a California State Historical Landmark. The site was honored as the birthplace of "Silicon Valley," the state's center for high-tech manufacturing. Despite its size, HP kept a loose management structure. Each division in the company did its own research and development and manufactured its own products. As a division grew, it was split into smaller divisions. HP's increased movement into computers, however, presented the company with new structural and marketing challenges. Although Hewlett-Packard had been making computers since the mid1960s, it was not a major presence in the industry. HP began to address that in 1980, when it introduced its first personal computer (PC). It also produced larger, more powerful computers, some costing up to $25,000. The various HP models, however, were not compatible with each other. In addition, the company faced tough competition from International Business Machines (IBM), which had started selling personal computers in 1981. By the end of 1983, HP had less than five percent of the PC market. Still, the company knew its potential growth was tied to these smaller computers. Although highly respected in technical circles, HP and its products were not well known by the average U.S. consumer. The company began a new advertising campaign to boost its image. HP also placed its different PC operations in one new group. Finally, in 1984, it introduced several new products. One was a portable computer that could work with IBM's popular PCs. Older HP models could not run IBM software. More significant were two new printers designed for any computer: the ThinkJet and the LaserJet. The ThinkJet, an ink-jet printer, offered better print quality than other inexpensive printers on the market. The LaserJet came out of a partnership with Canon, a Japanese manufacturer of cameras and copiers. Priced at almost $3,500, the LaserJet was a high-quality business printer. In a 1984 interview with Forbes, Cyril Yansouni, the head of HP's new PC group, explained the printer's importance to the company: "If the LaserJet gets us into the executive office, they'll remember us the next time we come around with computers." In 1966, Hewlett-Packard opened HP Labs, a new research facility. Today the company has seven research sites around the world, working on such products as computer storage systems, Internet technologies, and printers. Over time, HP introduced new models of both printers, and prices fell while quality remained high. HP set the standard for computer printers and dominated the market. The sales of replacement ink and toner cartridges also helped boost profits. Over time, the company improved its PCs and slowly took over a larger part of that market. By 1990, Hewlett-Packard's annual sales were more than $13 billion, but its profits were falling slightly. The company purchased Apollo Computer in 1989, and mixing its products and staff with HP's proved difficult. Thousands of jobs went unfilled after workers retired or left the company. To counter the slowing growth, the company began selling a new "palmtop' computer, the size of a pocket calculator with as much processing power as a PC. In 1992, it introduced a new color ink-jet printer, reinforcing its dominance in the printer market. High-tech industries saw explosive growth during the 1990s, and HP benefited from this boom. Sales grew as much as $7 billion in one year. The company launched a new line of personal computers and continued to sell more sophisticated machines to businesses and researchers. By 1997, HP was the world's second-largest computer manufacturer with sales reaching $35.4 billion out of total company sales of $42.9 billion. Despite its success with computers, HP faced tough competition and profits fell in 1998. The next year, it decided to concentrate on computers and related products. HP formed a new company, Agilent, to build and sell its testing and measuring devices. HP also made news in 1999 when it hired Carleton "Carly" Fiorina as chief executive officer (CEO). She was HP's first leader to come from outside the company. Faced with slumping sales, Fiorina planned to increase HP's development of new products and combine its dozens of divisions into just three. A relationship with microchip maker Intel led to the Itanium, a new kind of chip for computers. In 1976, Hewlett-Packard lost the opportunity to become a leader in the PC market when it decided not to develop a new personal computer built by one of its employees, Steve Wozniak. Wozniak left HP and co-founded Apple Computer, Inc. (see entry), the company credited with selling the first successful personal computer. 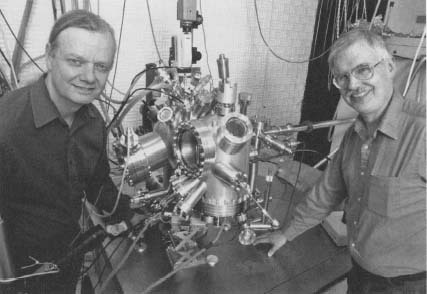 Two Hewlett-Packard scientists stand next to a scanning tunneling microscope at the Hewlett-Packard headquarters in Palo Alto, California, that is used as part of Hewlett-Packard's molecular electronics research. announced his intention to vote against it. He controlled about 5 percent of HP's stock, owned by the Hewlett family and a foundation set up by his father, who had died earlier in the year. As Hewlett spoke out against the deal, other shareholders and some employees questioned the move. Compaq's stock value fell during 2001, and some opponents claimed HP was paying too much for its rival. By December, Hewlett said that shareholders controlling almost 20 percent of HP's stock were against the deal, and he asked the company's board to withdraw its offer. The battle went public as Hewlett launched a Web site, www.votenohpcompaq.com , and took out newspaper ads opposing the deal. HP fired back with its own Web site and newspaper ads, sometimes accusing Hewlett of lying. The company argued that its founders would have supported the purchase. By the end of February 2002, HP said it had enough votes to secure the deal. The deal was finally approved, and by May Fiorina was announcing leadership changes and new product strategy. With the merger, the new HP almost matches industry leader IBM in size and revenue. The new HP claims about 20 percent of the worldwide PC market and remains committed to introducing new products.